I was saddened to read recently that once Christians make it to refugee camps, their sufferings are not over, nor even in Europe. There are many cases reported of Muslims who fled trying to impose Islamic regulations on these people, even calling for Shariah. This makes no sense to me: you gave up everything to make a risky crossing over the desert or sea from the madmen of ISIS/ISIL and you want to impose Islamic regulations on your countrymen who are Christians? So, the result is Christians ask to be put into their own neighborhoods in the camps if possible, or even better, to have their own areas to live in. This is the case in the Kurdish capital of Erbil where many Christians go to Ankawa neighborhood, a district that already had a big Christian population. In buildings given over to refugees, Christians try to move together rather than risk assault and insult by Muslims. 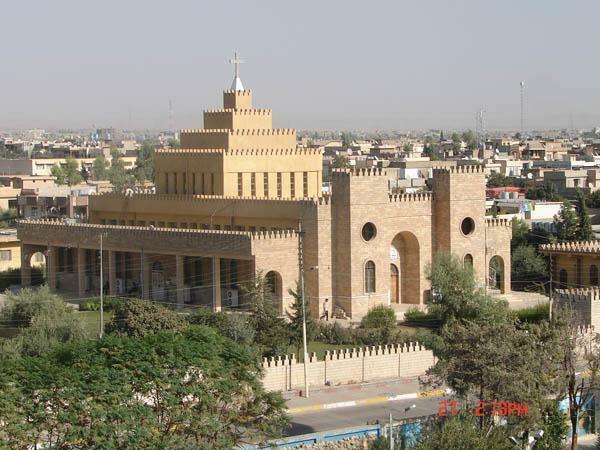 St Joseph church, Ankawa neighborhood, Erbil. The style is meant to recall the ancient ziggaruts that once dominated the skyline of Mesopotamia 3,000 years ago. The ruined interior of St Kevork Armenian church in Aleppo. The Knights of Columbus have provided $4 million to help the Christians now displaced in the Middle East. The Knights’ generosity provides monthly food baskets, and helps the local eparchies set up chapels, clinics and schools. Learn more and donate at http://www.kofc.org/en/christianRelief/index.html. When you go there, send the link around to other people and spread the word. Aid to the Church in Need was originally founded by a Belgian priest to help German Catholics expelled from all over Central Europe (Poland, Czechoslovakia, Hungary, Romania, Yugoslavia) into the ruins of West Germany. He and his helpers forgave the German people for the atrocities committed by the Nazis and then expanded their work to go behind the Iron Curtain, the only Catholic agency to do so. Since then they go wherever the Church is persecuted – unfortunately for us, that’s a lot of places today. The bishops beg them for assistance constantly. Go here: http://www.churchinneed.org for the US Office. PS Because of the work of ACN, a Muslim fighter helped Father Jacques Mourad escape from being held by ISIS/ISIL. Father kept his peace of mind while waiting for his throat to be slit at any time by praying: “Father, I abandon myself into your hands; do with me what you will.” I don’t know if I could have managed that. Interior of a Chaldean Catholic church: notice the statues of Our Lady (left) and St. Therese (right). Everything else follows the Syriac traditions. Below: Zaatari Refugee Camp in Jordan: 115,000 people live here now! « 1,652 years of Christian worship may soon end – ISIS is four miles away.